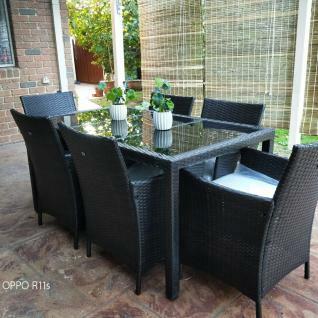 The grey Tavola is a simple and elegant set made up of a rectangular table with 6 chairs in rattan. Its clean lines mean it will fit in with any decor, inside or outside. 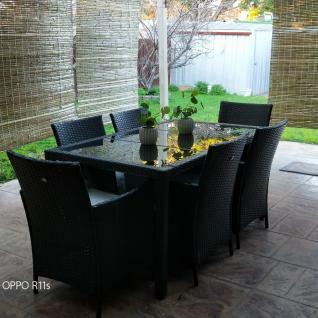 Polyrattan is sturdy and on-trend and is resistant to the sun's rays and bad weather. Its galvanised steel frame is powder coated in order to limit corrosion. We carefully select the material to weave our furniture, in order to guarantee longevity for our sets. The table top is made from 3 panels of 5mm-thick toughened sandblasted glass. This is 5 times stronger than traditional glass. The cushions are water-resistant. This means they can withstand small splashes and drizzle, however we recommend storing them inside when it is raining. The cushion covers can be removed with the help of a zip.